In our latest Houzz Kitchen Study we found that Houzzers' top kitchen design priority is having a stylish and beautiful kitchen. It's no wonder then that those who have improved their cooking spaces are spending more than 3 hours in their kitchens - every day! That's a lot of cooking, baking, socialising and working! For those of you who are looking to upgrade your kitchens (perhaps to spend even more time in them), we have a fantastic competition! 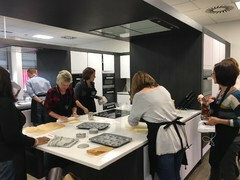 We've partnered up with top appliance brand Miele to offer 15 lucky Houzzers and their +1s, who are actively planning a kitchen renovation, a full day in Miele's Abingdon Experience Centre, 16 November (10am-3.30pm) The day includes a cooking demonstration by Masterchef the Professionals finalist Sven-Hanson Britt, a hands-on cooking experience, followed by a design consultation with a kitchen expert. You'll also enjoy a delicious lunch! Simply post a comment below telling us one thing you'd like to change about your kitchen and you'll be entered into a random prize draw. 15 winners will be selected. The competition closes at midnight, 30 October. By registering your vote and adding a comment, you're agreeing to our competition terms and conditions. Only UK entries this time! My Victorian house has a horrible, badly planned, 90s kitchen. I would like to get back some of its Victorian charm and character, while making it a useful space to work and socialise in. We have just had plans drawn up for a new extension to house a new kitchen diner. I can't wait to plan the space, one thing I would change is a new higher oven (rather than under hob) so it is safer (away from children!) and easier to get to, possibly even side opening?! Just moving into a new home & think I'll need more work surface! Building our first house (always rental until now for the family) but unsurprisingly foundations work has been significantly more costly. As a result we will likely be installing a cheap kitchen into a house that has been designed to the best sustainable criteria (passivhaus etc) as the internals are the only place that we can now make savings. 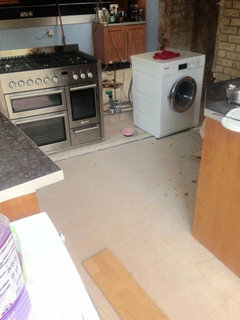 Would be great to see if it is possible to build a kitchen that we don't want have to rip out in five years just to get what we originally were looking for. Our corner cupboards! They are completely impractical and wasting so much space that could be used to store things. We are hoping for a whole kitchen re-do soon but need someone to help us plan it out! My oven. I hate my oven, and with so many lovely ones on the market now there's just so many great and useful features to choose from! Update everything as I have arthritis, particularly of the hands, so ovens and fridges at a higher level and push or sliding doors for the cabinets and pull out cabinets. I'd love to incorporate an island unit, with a linear hob set in it. An integrated good quality dishwasher would be fabulous! I'd like to change to a "wall" of integrated appliances and storage. We would like new state of the art integrated appliances, e.g. steamer+microwave ovens, integrated coffee machine, boiling water taps etc. We renovated our kitchen recently on a mid-range budget. As we 'inherited' some newish appliances from the previous houseowner, we reused some of them in the new kitchen but it's now time for change! The colour of the kitchen cupboards need updating and the cluttered work surfaces. We have quite a lot of kitchen gadgets which we rarely use and it uses up preparation space which stops me from making more effort at meal time. Would love a cooking experience to get me back into cooking from fresh. I would love new appliances. Make it a relaxed space for guests to chat while I'm cooking for them. We recently moved home and have inherited an under counter integrated fridge and a similarly sized freezer, both of which are far too small for our current usage. Having a stand alone fridge freezer in the garage is an option but not ideal. This leads to the inevitable conclusion of a kitchen overhaul. I would like to have kitchen cupboards that are actually attached to the walls. Some walls would be nice too! 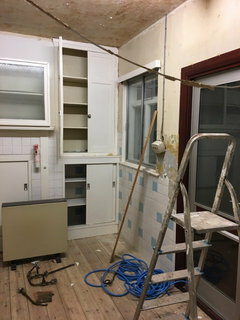 We are currently renovating(ripping out everything) my Mums' bungalow and would love someone to design our perfect kitchen ie. Where eye level oven, grill, micro wave should go. The hob. The sink. The electrics. The gas. The lighting. Just everything!!! What a perfect time for a kitchen competition!!! Good Luck everyone!!! Moving to a house with no utility room, I know but we love the house so have to compromise, and therefore need an integrated washer/dryer to replace separate appliances. We are planning on renovating a 70's kitchen from floor to ceiling, so we are thinking every thing all over again, from appliances to cabinets, adding an island and changing windows. It will be our first kitchen tailor made to our cooking and baking taste. We are very excited about it ! To turn our kitchen into the true heart of the house, rather than the broken kitchen/dining/route-to-the-bathroom it currently is. Requires a little more than just new appliances!! 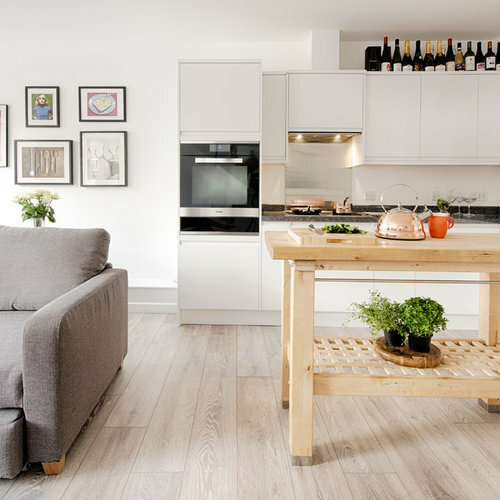 We have a young family and love to entertain and would love to create a kitchen/dining/living space that is welcoming, functional, sociable and has that wow-factor whenever you enter the room. Renovations began today we are extending the kitchen and would very much welcome the expertise of an interior designer to guide us towards the kitchen of our dreams. I would love a full size fridge freezer. At the moment we are living with an under the counter fridge for a busy family of 4 and we cant even buy enough milk to keep us going for the week cause we dont have the space to store it! If i am being greedy, id even ask for a utility room to hold a freezer and washer/dryer (theyre in the shed at the moment.) I drive past Miele showrooms everyday on my way to work and I dream of someday walking in there to buy my entire kitchen. My entire kitchen needs a makeover, but i would settle for a fridge at the moment! About to start a kitchen extension in Feb 2017. Established we will have a great new space.....now completely bemused as to how best to arrange everything layout wise, colour wise, appliance wise......err.......the lot really !! I want to change theU-shape layout to a proper island. Would be great if we can move the cupboards to under the stairs so that we can get more full height space. I am having a kitchen extension and I would love to plan in a hide and slide oven that is a cake only oven so I can bake to my hearts content! I would love an oven which has controls that do not burn my fingers! Thanks everyone for commenting, lovely seeing so much engagement! I've contacted the winners already, so please make sure you get back to me as soon as possible to confirm! Thank you! 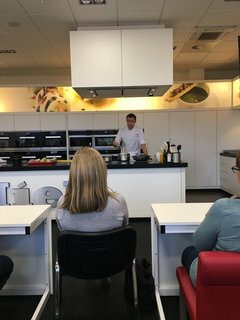 Hi all - I just wanted to share some photos from yesterday, when all of the winners got together for a full day out at Miele's Experience Centre in Abingdon - thanks for hosting! Design consultations with Lacy-Hulbert, Herbert Williams, Austin Matthews, Evie Willow, Das Kuechen Studio and Broadway Bespoke Kitchens. Making mince piece and Viennese shortbread. Hope to see you at another event! Great day! 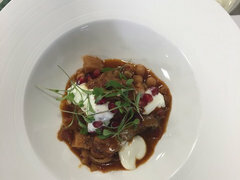 Loved the cookery demo, mince pie making and lunch (yum!). Learned lots about steam ovens and think the induction hob is definitely the way to go in my new kitchen! Great tips regarding wooden worktops from the kitchen expert I chatted to. Great experience all round, thank you Emmeline, Houzz and Miele. Thank you Emmeline and Houzz for organising this event. 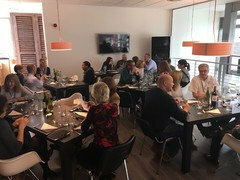 Thank you Miele for hosting such a wonderful lunch. My friend and I were very impressed with the whole Experience, the demo, the hands-on activity and not forgetting the goody bag! Thank you so much! I did not need the consultation time with the designer, however, was able to have a one-to-one with one of the Miele reps who went through various appliances and answered my queries. I will definitely be getting several Miele appliances and possibly, enrol my husband and I on a one day course, time and vacancy permitting. 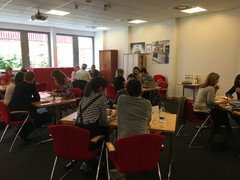 What a great day yesterday, meeting so many friendly, helpful and enthusiastic people from both Houzz and Miele and then all the others who were joining in as winners and 'plus ones'! Sven made it all look so easy and made me want to get ALL the new gadgets Miele has to offer in a kitchen. We thought we had the best kitchen designer allocated to us and we will be asking for a quote from him, and then we spoke to others and they all said the same for the designers they spoke to, so to me it spoke volumes of the quality of people Houzz had chosen to be involved in this day. 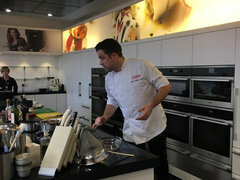 Miele Experience Centre is a 'must' visit before buying kitchen appliances. This was our second time there and I cannot speak highly enough of all the the knowledge and candour of the Meile reps. Thanks Emmeline and Houzz, a fine day only problem was it went by too fast. see us if you need any more help. appliances and how you can use them in your own kitchen. and enter code TFD24FREE at the checkout. I WOULD ANEW MIELE OVEN AND HOB. NO MORE BENDING DOWN .. The extractor - it doesn't work! I'd like to take my kitchen out of the 1980s! Wall mounted cooker hoodwith energy-efficient LED lighting and touch controls for simple operation. Do you have a fire pit in your garden? Kitchen Island - hob or sink?